Adventures of the TV Addict, the Wannabe Writer, and the Should-Be Famous: Some peeps at ETSU are gay. "TELL THE COPS I KNOW ALL MY RIGHTS!" Is something different around here...? Note: For this current masterpiece of manipulation you're looking at right now, I'd like to thank summer vacation, Lost and Taken textures, GIMP, Photobucket, Wikipedia, Open Office, my wrists, and my thumbs. Confused? Here's an explanation of the blog roll. Click the button and subscribe, you'll feel better. Come with me if you want to live. 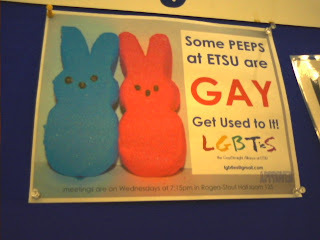 Some peeps at ETSU are gay. When you see it, you will LOL. GLBTies, our local glbt militia, have been making the rounds lately. Too bad the petty bastards won't change their meeting times, but I loves them anyways. renalexandros-at-gmail-dot-com. Except, don't spell it...yeah...you know. My AIM username, if that's what you like, is, conveniently enough, Renalexandros. Or Twitter. Or if you really have a problem, Facebook.